By The Travelers Companies, Inc. The Travelers Companies, Inc. released information identifying the most common and costliest homeowners claims. Based on a review of its U.S. homeowners insurance claims made from 2009 – 2015, Travelers found weather incidents were the most common cause of damages, resulting in more than half of all claims. Wind, pipes freezing and bursting, roof and flashing leaks and ice dams were among the major issues leading to damage during weather events. While weather-related claims were most common, fire caused the most expensive claims, accounting for nearly one quarter of the total claim costs. Fires were often caused by appliance and machinery misuse or failure, electrical problems, including wiring or outlet issues, and cooking. 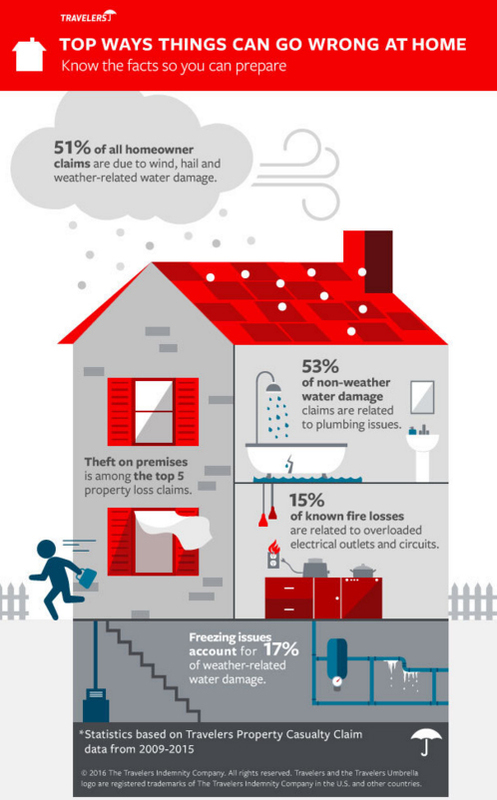 Hail, wind, and plumbing or appliance leaks followed fire as the most expensive claims. There are typically two main causes of water damage — weather events, such as rain or snow melt, and other issues, such as pipes bursting or leaking. By comparison, more water damage was caused by events such as a pipe bursting, or plumbing or appliance issues, than from the weather. In the Northeast, wind was the most common cause of claims. The weight of ice and snow on the roofs of homes was also a common claim throughout the region. Fire was the costliest source of claims for homeowners in this area. In the South, wind was the most common cause of home claims and hail was the most expensive. In the Midwest and West, hail was both the most common reason for a homeowners’ insurance claim and caused the costliest damage. Midwestern homeowners also saw repeated problems caused by sewer or sump pump backups. To help consumers keep their property and families safe, Travelers provides home maintenance steps, seasonal safety tips, suggestions about preparing for severe weather events and more on its Prepare and Prevent website. In addition, homeowners should review their policies annually to help ensure they have the coverage they may need should something go wrong. When damage occurs, insurance coverage depends on the specific circumstances of the situation, as well as the terms of the homeowners’ insurance policy. Travelers suggests that individuals speak with an independent insurance agent to help understand their policy and coverages. The Travelers Companies, Inc. is a leading provider of property casualty insurance for auto, home and business. A component of the Dow Jones Industrial Average, Travelers has approximately 30,000 employees and generated revenues of approximately $27 billion in 2015. For more information, visit www.travelers.com.